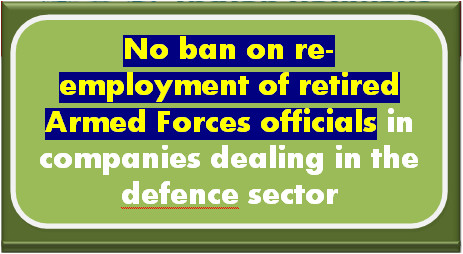 While there is no ban on re-employment of retired Armed Forces officials in companies dealing in the defence sector, officers of the rank of Colonel or equivalent and above, who retire with pension, gratuity or other benefits are, required to obtain prior permission of the Government for accepting any commercial employment within a period of one year of the retirement. 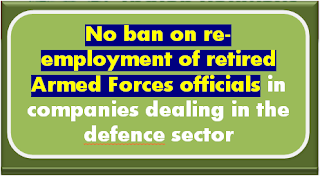 There are conditions that stipulate that they should not have dealt with sensitive projects or the company which they wish to join. This information was given by Raksha Rajya Mantri Dr.Subhash Bhamrein a written reply to Shri P.P. Chauhanand others in LokSabha today.